Greetings, I am Dona Spring, Berkeley Council member. As an elected official in Berkeley CA USA, It is great a honor and pleasure to receive our distinguished guests from Japan including,Seiichi Kaneta and Tomoko Abe, members of the Japanese House of Congress, so that we can continue to work together in solidarity for world peace. I would like to think of this conference as the first in many occurring in the U.S. that will continue the tradition started in Japan, "linking peace to life". My heart is filled with happiness and hope. I am so very privileged to live in and represent a community as enlightened as Berkeley, a place, along with Japan, that actively supports nonviolent approachs to world conflict. Many of us in Berkeley admire the nation of Japan for its national commitments to world peace. The Japanese constitution is providing all sovereign countries in the world with the model for world peace. To quote Article 9 The Constitution of Japan: "Aspiring sincerely to an international peace based on justice and order, the Japanese people forever renounce war as a sovereign right of the nation and the threat or use of force as means of settling international disputes." It is critical at this time of world conflict that the Japanese people hold firm to this commitment of using nonviolent means to resolve international conflict. Even more important is for us to inspire other peace loving people particularly in the United States to lobby our U.S. Congress and president to adopt a constitutional amendment based on Article 9. If all people the world over ,speak and act on our strong desires and determination to end of the use of physical violence as a means of resolving our international conflicts. We have to inspire our fellow humans to successfully over come our lower natures need for control and power through physical force. Through our good intentions and hard work, we shall over come and triumph for all humanity and all other living things we share this planet with. Berkeley is a community of riches, on a material level we are among the world's most prosperous, on a social and cultural level we are blooming as well. This is a community that values peace, social justice for all and preservation of our world's natural environment. The City of Berkeley has Commissions and sister cities that are working to advance causes on all of these levels. Berkeley has an extensive network of nonprofits working to benefit humanity and the environment. In addition, there is a strong community of temples and churches--all denominations working from a social activist position resulting from a spiritual perspective. 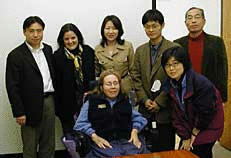 Working together the social activist nonprofits and the religious groups can unite in an international coalition to bring about passage of an additional U.S. constitutional amendment based on the Japanese Article 9. Many people in the U.S. and Japan are hungry for alternative sources of information and approaches to world conflict and what they are being bottle fed in a heavily censored corporate controlled U.S. media market. Unfortunately the massive people in United States do not have access to alternative new sources as we do in Berkeley and a few other major cities. How difference our national debate would be if all people had access to our Berkeley born KPFA free speech radio. KPFA, listener sponsored radio, was founded by a World War II pacifist. We must work to resolve our international conflicts through a strengthened and more just United Nations and through the world court. Terrorists and those who resort to acts of violence against civilian populations should be brought to justice through an international world government and peacekeeping force. Until we have greater justice for the world's poor and a more fair redistribution of resources to populations in underdeveloped countries, the conflicts and violence will only increase. Without justice there can be no peace. Our current world leaders have let us down. We must return to the wisdom of our elders.
" Every gun that is made, every warship launched, every rocket fired, signifies in the final sense a theft from those who hunger and are not fed, those who are cold and are not clothed." Regardless of political or religious beliefs, we are united in the desire for peace and reconciliation in the Middle East and throughout the world. While we have compassion for those who have suffered from the September 11 bombings we also grieve the approximately 3000 people in Afghanistan who have died as a result of U.S. bombing. As many as 7.5 million Afghanistan people have become refugees from over two decades of armed conflict. Without major intervention of food and medical supplies many of these people will continue to die. Imagine what could be done if the billion dollars a month that is being spent on bombs, weapons and military personnel could be converted to humanitarian assistance including food, medicine, removal of landmines and undetonated cluster bombs, rebuilding of hospitals, clinics and schools in Afghanistan. The rest of the world will feel more in coalition with the United States with these acts of generosity for the poorest of the poor. The USA and other rich and powerful countries in the world, must set an example of how to treat those less fortunate than ourselves. The message (along with weapons) that most struggling countries' feuding tribesmen get from the superpowers is: those with the biggest bombs, guns and military might become the victors. Yet, our esteemed leaders for political and human rights including Mahatma Gandhi, Jesus of Nazareth, Martin Luther King, Cesar Chavez, the Dalai Lama have taught us by example to choose nonviolence in the resolution of conflicts. Our country's Pledge of Allegiance embraces: "liberty and justice and for all". Toward this end let us urge our representatives to devote our government's best efforts in collaboration with governments throughout the world, in addressing and overcoming those conditions such as poverty, malnutrition, disease, oppression, and subjugation that tend to drive some people to acts of desperation and terrorism. Our strength and security will come from supporting democracies in developing nations. Let us work for an independent Palestinian state while also supporting Israel's right to exist. How effective were a decade of bombing and sanctions against Iraq, which has resulted in tens of thousands of civilian deaths? How many more thousands of children will be maimed and killed in pursuit of Sadam Hussein? A contributor to the Middle East conflict is the desire to keep the supply of oil flowing for western countries' consumption, which in turn is destroying our planet's ozone protective layer. Our federal and state leaders must be required to engage in a campaign to lessen our dependence on oil from the Middle East and to commit to a nation-wide conversion to renewable energy sources such as solar and fuel cells. We can make choices in our daily lives to ride bikes, take mass transit and eat an energy-environmentally efficient diet centered on plant vs. animal products. The U.S. greatly benefited from George Osawa, a Japanese citizen who taught the West the ancient principles all macrobiotics. Macrobiotics is about creating peace and bringing humanity in harmony with the cosmos. The diet is primarily a plant based diet based on availability of a particular bioregion. Each one of us has the wisdom and power to create a more peaceful, healthy world. "Man must evolve for all human conflict a method which rejects revenge, aggression and retaliation. The foundation of such a method is love." -- Martin Luther King, Jr., 1964.